Barley is indispensable to brewing and for the best brews only the best barley will do. 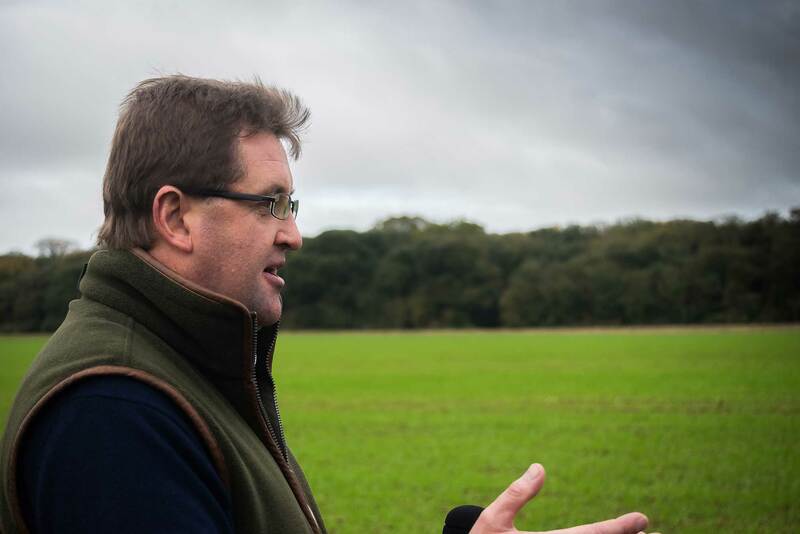 Nick visits the Earl of Leicester’s Holkham Estate to see how they grow the finest barley for the varied beers of Marston’s Brewery. ‘We listen out for geese at night, you wake up sweating’. Holkham Farm Manager James Beamish is telling me in his wonderful Norfolk accent how natural predators such as geese can undo months of work. The flying pests can eat a lot of barley and in a very short time. 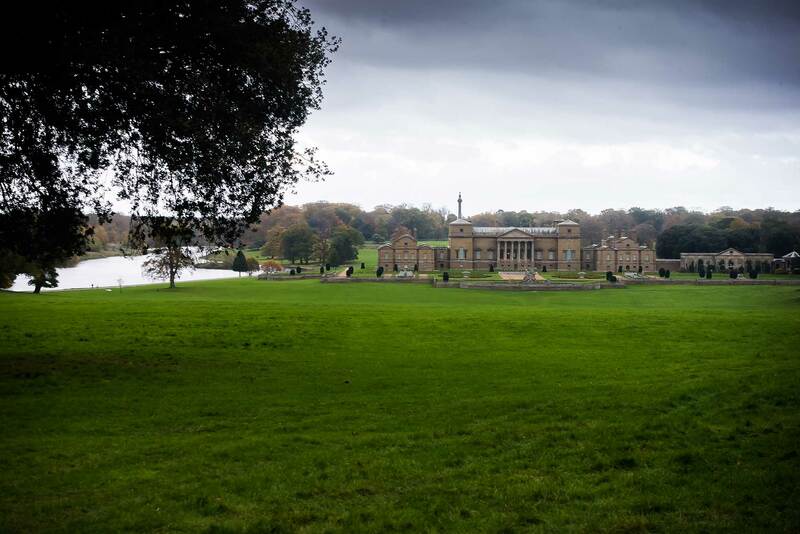 It’s a natural hazard they have to deal with at Holkham, the massive estate of the Earl of Leicester made up of 10,000 hectares of farmed land of which 1000 acres are are give over to game, pasture and conservation. 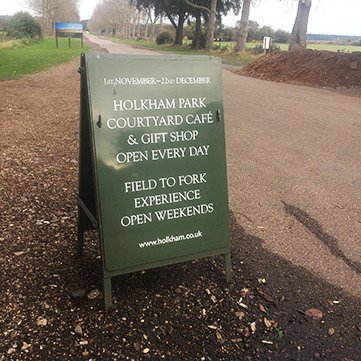 At Holkham they use the crop rotation system created back in the late 18th Century by the Earl’s ancestor Coke of Norfolk, which is basically swapping crop after crop through the year to make best use of the land and naturally increase productivity. Back then it was four crops, now it’s six including potatoes, sugar beet and of course barley. Coke’s name by the way is pronounced Cook, ‘so it is!’ says James, who ends most of his statements with this rather charming second-affirmative, presumably a local dialect. Crop rotation, when done properly alongside other organic techniques, reduces the need for artificial fertiliser and pesticides. It feeds the soil and puts it in balance so as to cut disease, build nutrients, and grow yields all in a natural un-forced manner. As we drink warming mugs of home-made ‘Horlicks’ (made from farm barley) Director of Farming Poul Hoveson explains that when he first arrived on the estate the roads and lanes were swimming in the run off of artificially-applied nitrates, while the soil itself looked barren and sad. Not anymore. Careful, sensitive stewardship of the land has made it very productive and one of their special crops is the Flagon variety of barley. It’s special because here in Norfolk, where frosts are virtually unheard of, they can grow this winter barley ensuring supply to their biggest customer Marston’s Brewery who have been at the brewing game since 1834 and work closely with the barley growers. Malt which comes from barley is indispensable to brewing, the barley is dampened until it begins to produce tiny sprouts then gently kilned for an alluring ‘Horlicks-like flavou. 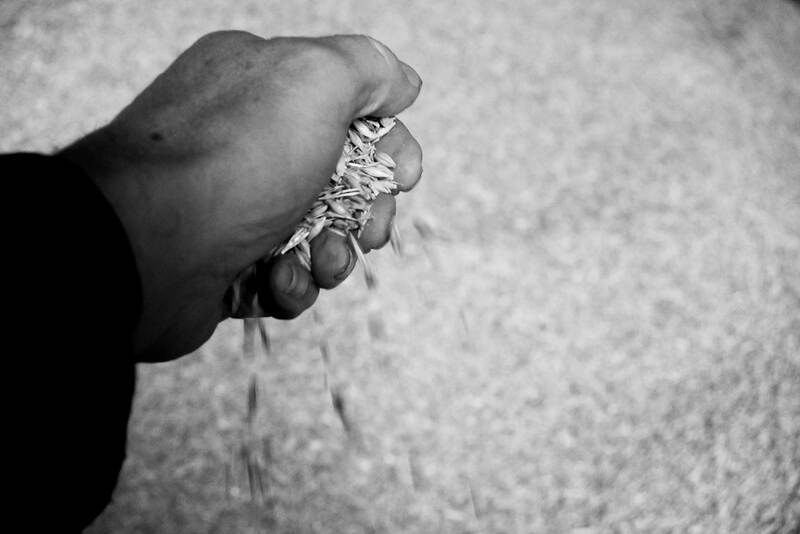 The sugars of the barley feed the yeast that creates the alcohol in the beer, as well as delivering the flavours. It’s a massive operation with the barley stored in huge hangars after harvest. The unwanted parts of the plant are fed into two giant anaerobic digesters, ‘basically enormous cows’ stomachs,’ says Paul, that convert it all into methane gas which is sold to the national grid. All very green. 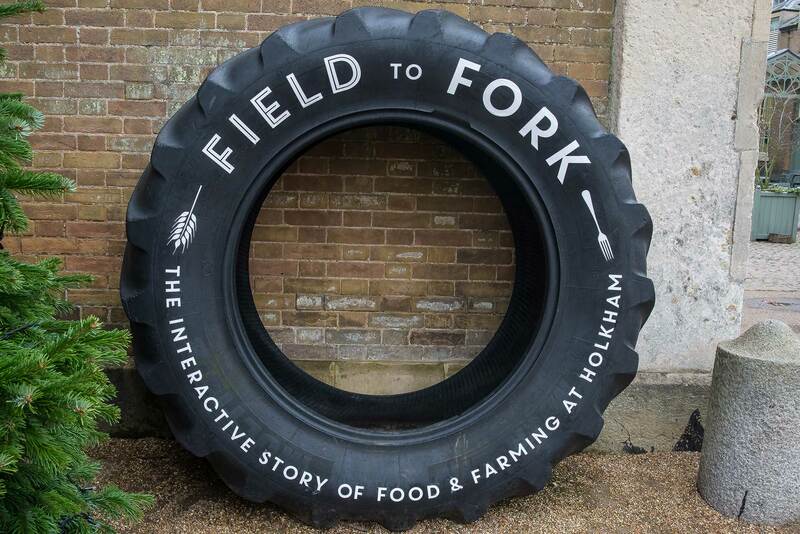 Management of the estate in an ecologically sound way is important to the 4th Earl who pops up, rather like Ralph from the Fast Show, in videos playing in the fascinating Farm to Fork exhibition at his ancestral home Holkham Hall, a beautiful mansion at Wells Next The Sea. Much of the land on the estate is set aside for wild growth to encourage birds, insects and small creatures who all help defend against pests. Larger animals such as cows are chosen by breed to graze on suitable land for their needs and the sheep are also the ‘Golden Hoof’ of ancient times; their movement, and their bowel movements, all helping to naturally till the earth and fertilise it. And when the mechanical plough is needed, it digs very shallowly to preserve the soil structure. It’s all rather fascinating but what about some beer? We head off to an old shooting lodge called The Temple in the Holkham woods near to the Hall to have a spot of lunch and some liquid refreshment as Marston’s brewer Callum Turner has turned up with a lot of samples. 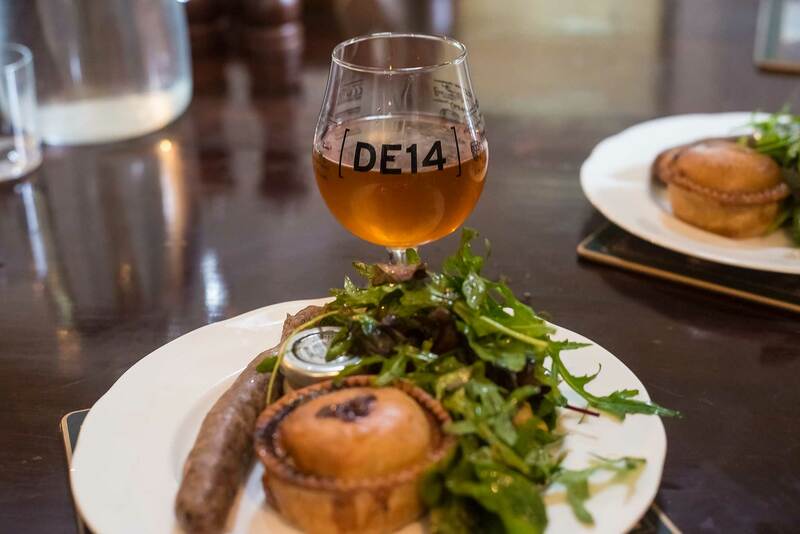 Two small batch beers from the Marston’s DE14 nano brew kit are served up with Chef Michael Chamberlain from The Victoria Inn’s venison sausage and pigeon pie in front of a toasty-warm wood burner. 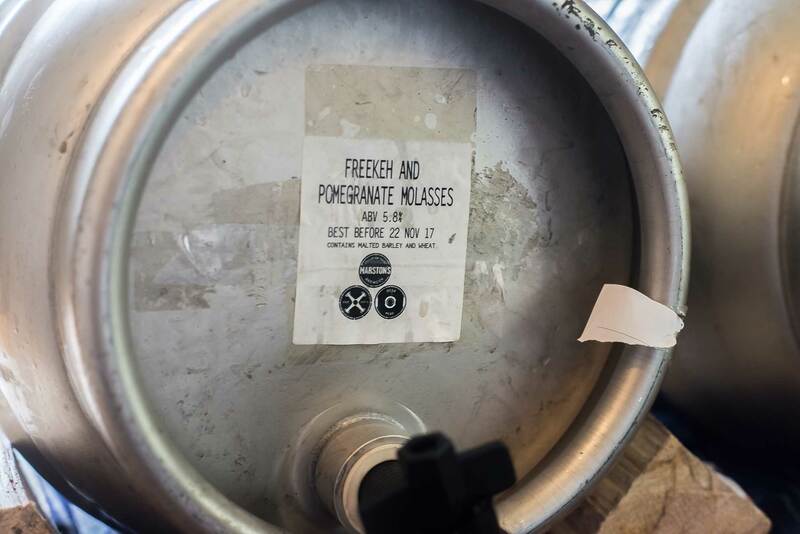 Freekeh and pomegranate molasses beer is an interesting one, freekeh being an ancient form of grain picked while still green. The molasses adds a sweetness that works with the game meat. Similarly effective is a second beer made from smoked wheat and honey, which tastes rather like mead. Neither perhaps will ever get to mass-market, but are examples of Marston’s constant desire to experiment and innovate in order to excite the nation’s beer enthusiasts. 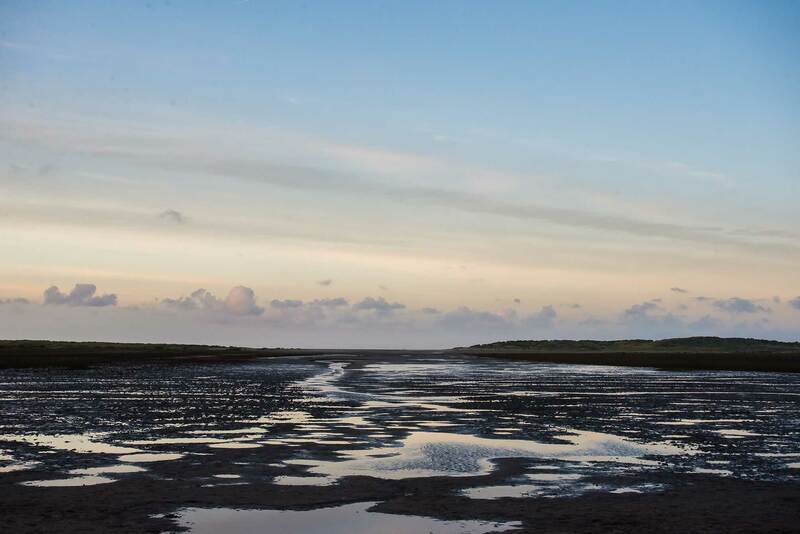 We decamp to beautiful Holkham Beach, where Gwyneth Paltrow once ambled in the film Shakespeare In Love and where locals hint that you can occasionally see Her Other Majesty, Elizabeth II, walking the dogs. It’s stunning and kept that way by the Holkham Estate’s careful management so that it’s a paradise for dog walkers, birds and for bird watchers or twitchers as they’re known. 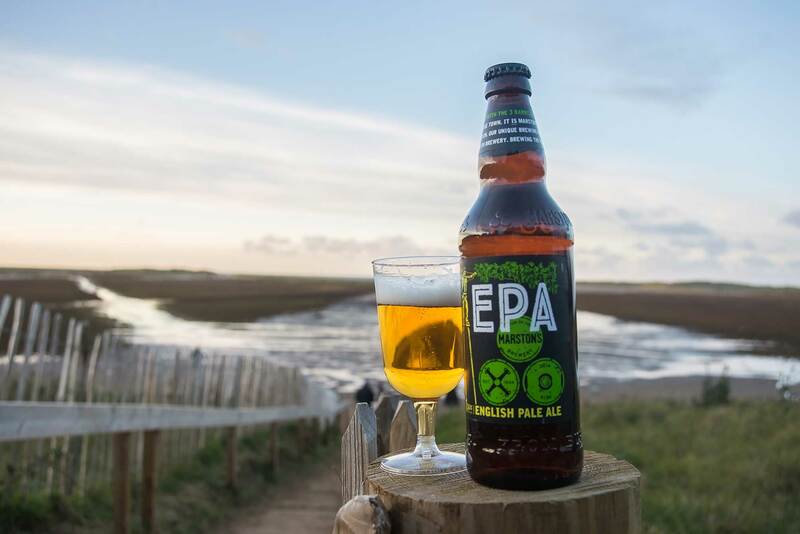 I’m a bit twitchy myself, thirsting for some more Marston’s, so we crack some bottles of Marston’s EPA (English Pale Ale) a light, citrusy, beer that’s very refreshing, although perhaps not best drunk in the freezing dusk wind that’s now storming inland. We head back to the nearby Victoria Inn for some cold beer in a warm bar with a beer-matched dinner to follow. The Victoria Inn sits just at the gates of Holkham Nature Reserve and the beach, a perfect place to stay any time of year. Inside it’s all roaring fires and classic country hotel charm largely unchanged in feel since it was built in 1837. The window in my room looked like it was still the Victorian original. 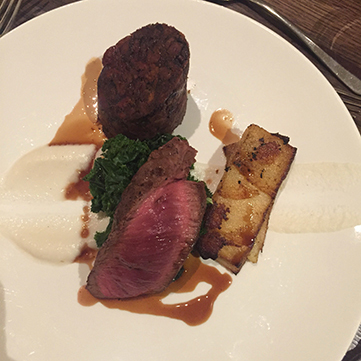 In the kitchen Chef Michael uses fish and shellfish from the north Norfolk coast, beef from Holkham farms, lamb and pork from farm tenants, wild game from the family shoot, and today venison from the estate’s herd of Fallow Deer. 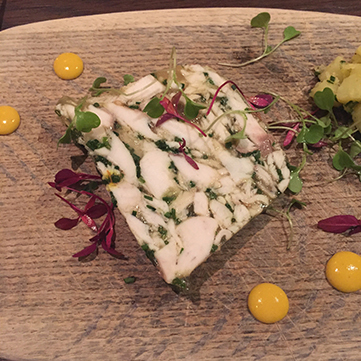 We start with a pike terrine with fennel, warm potato salad with winter barley-malt bread and chef’s Honey beer bread, all with that other Norfolk famous product, mustard. I’ve always found pike to be a terribly bony fish, as well as a rather terrifying one, but this dish shows its solid, meaty, side. It’s paired with more of that hoppy Marston’s EPA, English hops, by the way, so that’s good for a post Brexit pint, and Marston’s 61 Deep which uses American and Australian hops. The 61 Deep gets its name from the depth of the well at the Marston Brewery; it’s fruity and floral and works best when drunk after a forkful of food laden with that fiery mustard dressing. A beer to drink with anything spicy – Mexican Indian, Thai, you know the drill. Second up are Marston’s Pedigree and Marston’s Old Empire IPA . Most beer drinkers know Pedigree, it’s sold on draft all over the place, but the Old Empire may be new. It is actually very old recipe, the beer that fuelled the Empire now faithfully recreated for the modern world where Britannia no longer rules the waves. Both beers went well with roasted loin and braised haunch of venison, turnip dauphinoise, kale and redcurrant jus, the loin well cooked, i.e. pretty rare. I preferred the IPA for its complexity, Pedigree is fine by the pint but for me it’s not a dining beer. 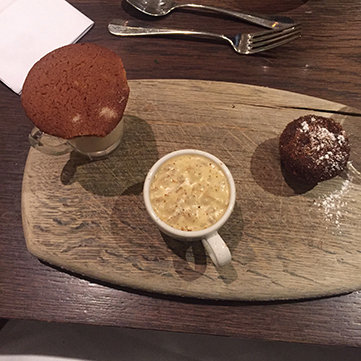 And so to dessert with the barley appearing in a barley pudding with along with a ginger malt crunch biscuit, doughnut muffin and a malt milkshake. This was washed down with Marston’s Pearl Jet Stout, and Marston’s Cherry Head. The latter’s label promises a cherry stout with hints of chocolate malt and Black Forest gateau and there was definitely cherry there, but it wasn’t to my taste. The pearl jet stout was more my thing, a bitter-sweet experience that helped the sugars go down a treat. And what a treat it was to sample Marston’s Beers at the place their barley comes from and see how modern farming needn’t be destructive or unsustainable, just as long as you listen out for the honking of geese. This entry was tagged beer, brewing, culinary tourism, Food, Holkham Estate, IPA, marstons brewery, nick harman. Bookmark the permalink.